The Cutest Kitten - Enter the battle and may the cutest kitten win! Click on the cutest kitten pic! Can't decide who's the cutest kitten? Refresh the page for a draw. 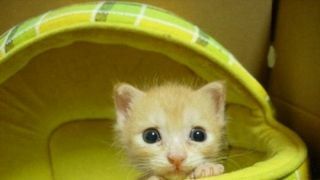 The Cutest Kitten - Enter the "kitten battle" and may the cutest kitten win! 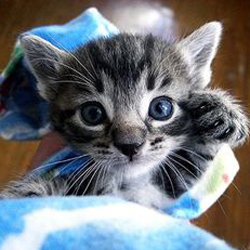 Welcome on TheCutestKitten.com! If you have come here, you'll probably like kittens as much as we do. In fact, we love all domestic animals but we have a special passion for cats and for kittens in particular ...they're so cute! So we came up with idea of setting up a website showcasing photos of our beloved kitties. There are some really nice kitten pics so we suggest you to go and have a look at them. Instead of presenting a simple gallery of kitten pics though, we decided to run a contest to make it more interesting and fun: every time you refresh the main page you'll find a set of two kitten pictures competing against each other. Click on the image showcasing the kitten you like the most to cast your vote. After that you'll be able to see how that particular kitten is scoring in the "Kitten Battle"! Enter the contest, cast your vote and find out which kitty is winning the title of the cutest kitten of all times! Some kitties are scoring better than others but we would like to stress out the fact that all of our kitties are lovable and sweet. In the end though, there will be only one cutest kitten! Can you help us decide who will be the winning kitten? Get your daily dose of cute kitten images, enjoy the "Kitten battle" and ...may the cutest kitten win! Do you have a kitten? Get him into the "kitten battle" contest ...upload a pic of your loved kitty! Are you the proud owner of a kitten? Would you like your kitty to take part in the "kitten battle" contest and see him showcased in our kitten photo gallery? Simply upload the cutest photo of your kitty from this page or post it in our Google+ wall or in our Facebook page wall. Remember that only one pic per kitten will be admitted to enter the "kitten battle" contest. If you'll post or send more than one pic of your kitty, we will choose the one we think it's the cutest. We do this because we want to avoid battles between two pics representing the same kitten. Our aim is to present fair kitten battles between two completely different kittens!